Get to know our new Regional Coordinators! We are excited to announce today the all-star members of TFF’s Regional Coordinator team, who will drive forward our overall mission to create a sustainable and inclusive food system by 2050. Hand-selected from hundreds of applicants from around the world, this diverse group of talented entrepreneurs, researchers, consultants, engineers, farmers and academics will help to lead TFF’s work in seven regions of the world: North America, the Caribbean, Latin America, Europe & Middle East, Africa, Asia, and Oceania. They will support TFF for a 3-year term, executing and advising on our overall strategy and program, developing strategic partnerships, and managing a cohort of regional TFF Ambassadors. Moreover, they will play a key role in ensuring our TFF global movement of next generation innovators becomes a critical force for positive change in the food and agriculture industry. 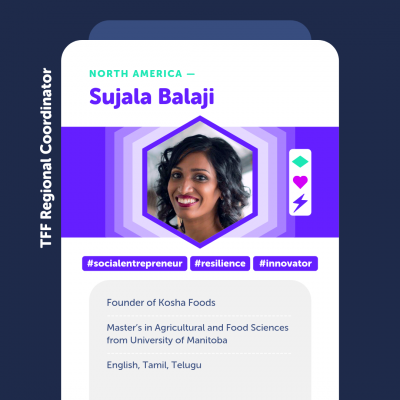 Sujala is a Social Entrepreneur who is passionate about creating sustainable food systems and supporting small-scale farmers while addressing issues like poverty, hunger, and malnutrition. This passion combined with purpose and love for the planet led her to create Kosha Foods, a food startup focused on plant-based foods using millets for the mind, body, and soul. With her expertise in operations and scale-up working for large food corporations, she consults clients in product development and innovation. Sujala is also a Certified Food Scientist and holds a Master’s degree in Agriculture and Food Sciences from the University of Manitoba. 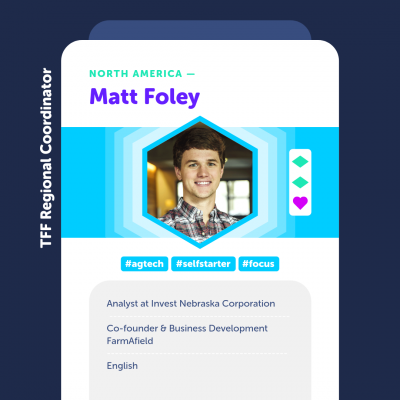 Matt began his career working to solve financial inefficiencies in agriculture and is passionate about exploring how the next generation of innovation can support agriculture around the world. He previously co-founded FarmAfield, a previous Thought for Food Challenge Finalist team, and assisted the company in their SBIR funding process with the National Science Foundation. He is currently a financial analyst for Invest Nebraska Corporation, a venture development fund, and has assisted in the due diligence, structuring, and post-investment of 20+ early stage deals including companies in precision irrigation, animal health, alternative proteins, and IoT in agriculture. He holds a Bachelor of Business Administration with an emphasis in Economics from the University of Nebraska and served as an American delegate to the 2017 United Nations UNleash Innovation Lab in Denmark. He is a member of the Angel Capital Association as well as the 44th cohort of the Venture Capital Institute. 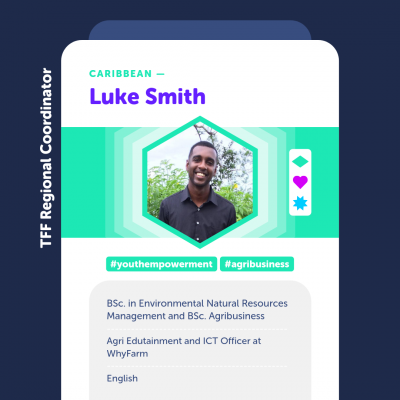 Luke is the ICT officer of Whyfarm, a NGO that pioneers Agricultural Educational Entertainment with a mission to promote the importance of sustainable agriculture among youth and children. He has a BSc. in Environmental Natural Resources Management and BSc. Agribusiness with Certificates in Natural Resources management for sustainable rural development and social media reporting. He is also a freelance agri-photographer, and has been an avid supporter of the TFF movement for several years. Adrian is a Plant Biotechnology PhD candidate at CINVESTAV-IPN (Center for Research and Advanced Studies of the National Polytechnic Institute) in San Pedro Zacatenco, Mexico and director in Mexico for the Kirchner Food Fellowship. Adrian received awards recognition for his academic and entrepreneurial adventures including being named one of the ten best “Innovators Under 35” in Mexico by the MIT Technology Review. Inspired by his work with smallholder farmers in Mexico, he thinks that food security should be tackled in a holistic and collaborative way that pays attention to the knowledge of smallholder farmers. Sergio is a young researcher in rural development from Bolivia. He graduated with honors from the Bachelor’s program in Environmental and Development Engineering at El Zamorano University and his Master’s program in International Rural Development at Ghent University. Sergio has worked in agricultural research and development for more than 3 years in six different countries in the Americas, Africa and Europe, and now is currently working as researcher for the International Center for Tropical Agriculture (CIAT) in Colombia. He is a One Young World Ambassador and member of the Honour Society of Agriculture Gamma Sigma Delta. He also served as catalyst and judge for other entrepreneurship programs such as the MIT Climate CoLab Competition, Hult Prize and Technovation. 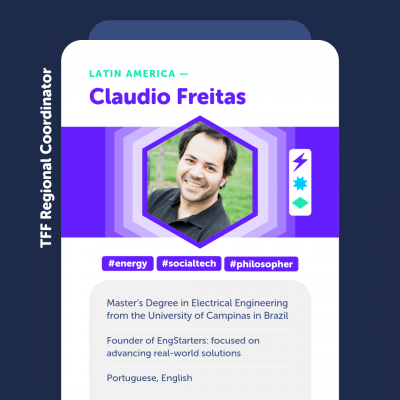 Claudio has a Bachelor’s degree in Control Engineering from the Higher Education Institute of Amazonia and a Master’s degree in Electrical Engineering from the University of Campinas in Brazil. Claudio spent over three years working in the automotive industry with embedded systems. In 2016, he entered the School of Engineering Education’s Graduate Program at the Purdue University (USA). His research is focused on technology diffusion and acceptance in developing countries which includes agriTech solutions. Claudio works for various projects related to interdisciplinary content, curriculum design, and online instruction. For this, he is developing educational kits, called EngStarter, focused on advancing real-world solutions for social problems at refugee camps in Jordan and Kenya. These kits foster agricultural practices in displaced regions through a DIY framework that allows users to learn electronics and basic farming principles while they build +10 different agricultural solutions using the same kit. Maame is passionate about applying the principles of food science to improve the livelihood of humanity food product development, research and entrepreneurship. She holds a BSc. in Food Science and Technology at the Kwame Nkrumah University of Science and Technology (KNUST), and currently pursues a Master’s degree in Food Science and Engineering at ISA Lille, France. 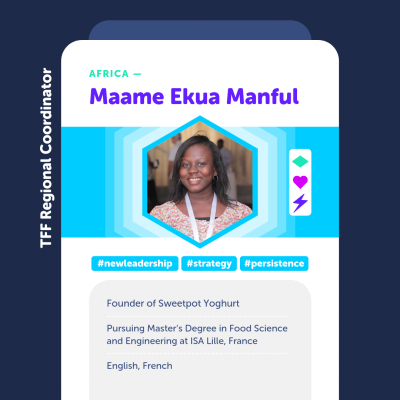 She is the team lead of the startup Sweetpot Yoghurt, a fortified yoghurt snack to help curb vitamin A deficiency in Africa which also provides a market for sweet potato farmers. Sweetpot Yoghurt has won various awards and was featured in global media: winner of the 3rd Prize Award at the British Council Blazing Trails for Entrepreneurs in 2017, award by the SME Ghana Awards, awards by the Ghana Science Association for the scientific presentations made on Sweetpot Yoghurt, winner of the Communication of Change Award at the 9th Annual Sweetpotato for Profit and Health Initiative in Nairobi with the theme “Progress in Research for Development for Sweetpotato in Africa”, and more. Her team was one of ten 2018 TFF Challenge Finalists. 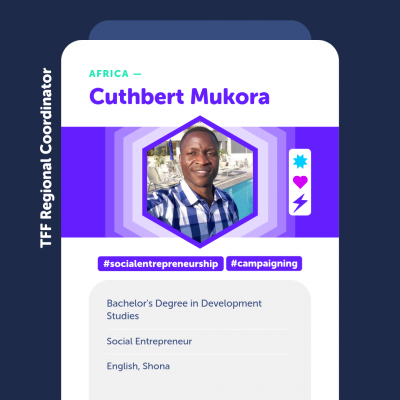 Cuthbert is a social entrepreneur and aspiring global leader who is passionate about transforming lives through social innovation. His professional goal is to transform rural communities in Zimbabwe into world-class economies by 2050, through supporting and investing in rural communities’ homegrown ideas, solutions and innovations for sustainable development. Cuthbert is keen to see young people and children participating towards the attainment of sustainable development. He is the Board Secretary and Head of Programmes at Rural Enterprise Trust of Zimbabwe (RETZ) and President of Net Impact Zimbabwe which is an affiliate of the California nonprofit public benefit corporation. Cuthbert was also a former Next-Gen-Council member at TFF. He recently won the Goalkeepers Youth Action Accelerator Award for 2019. Utsav is a mechanical engineer by degree and gardening enthusiast by passion. 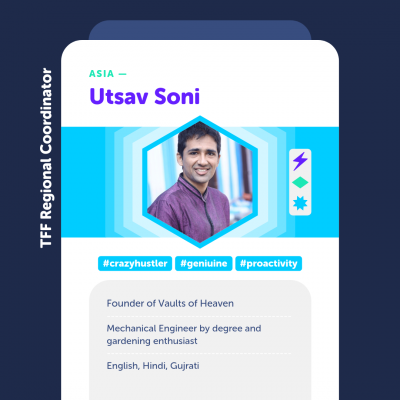 He is the Founder and CEO of a startup called Vaults of Heaven and 2017 with which he participated at the 2017 TFF Challenge and won the “Take it to the Farmer Award”. He believes Engineering without art is incomplete and excites others with his passion. Before founding his startup, he gained three years of vivid experience in developing sustainable technologies for local farmers and climate change and has been awarded for his work on a national and international level. Besides his career, he enjoys to experiment with engineering and does calligraphy. Brittany’s passion is for projects that build a meaningful and sustainable future. Her background in GIS science, and experience across not-for-profit organisations has led to her position at Esri Australia. For the last four years, Brittany has been helping organisations take ideas and turn them into reality through empowering clients from a vast array of industries to achieve success. A true advocate for the power of GIS, Brittany is passionate about educating people, no matter which field they operate in, about how ‘the science of where’ can fuel insight-driven decision making and solve organisational challenges. She was former Next-Gen-Council member at TFF and engaged as a teacher in the TFF Academy and Summit, where she provided counsel on initiatives and educated through GIS workshops. Her particular interest is in technologically challenging projects that connect community with sustainable and spatially enabled choices. Interested in learning more about the planet’s best and brightest food and agriculture leaders, exploring global partnership opportunities or exploring other ways to join our movement? Follow our activities on Facebook, LinkedIn and Twitter! Or reach out anytime to christine@thoughtforfood.org!